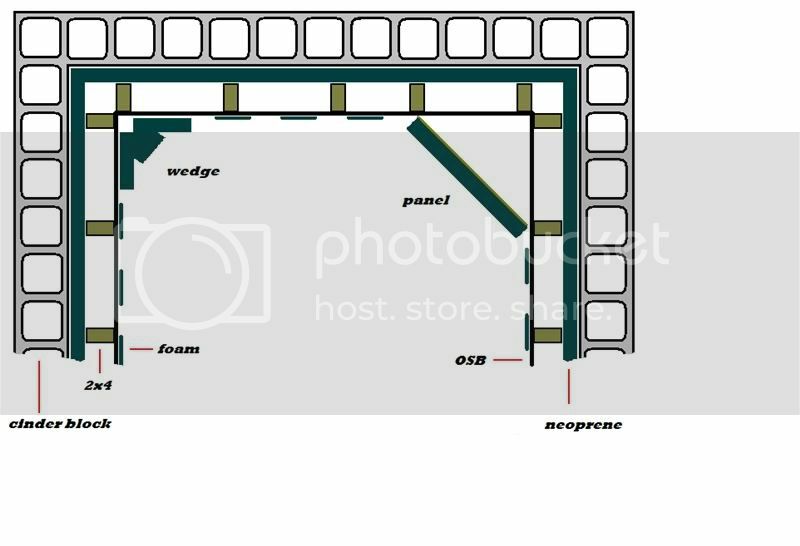 The DijonStock Digital Home Recording Support Forum • View topic - Acoustic Treatment...is this okay? Right. You need to tune the fridge. Not sure you can do that. I do know that you can tune a piano, but you can't tuna fish. Okay...so today I treated the big door, moved the cymbals, and tuned the fridge. You guys were right...seems the fridge was just low on beer. Then...I put up two large panels of fabric-covered 2" neoprene in opposing corners of the ceiling, and a 6' long v-shaped 'wedge' in the corner behind the door. Not perfect, but I'm working with what I have..
After doing this, I did some more reading up on bass traps, and it seems...my entire room may qualify as a bass trap. I neglected to explain, that there is more to my walls than OSB and foam tiles. It starts as 8" cinder block covered entirely with 2" open-cell neoprene, then studs forming a 3.5" void, then the 7/16" OSB, then the tiles. The OSB is not very tightly secured to the studs, and does resonate easily. Though not intentional, this design seems very similar to one illustrated on Ethan Winer's website. Soon as I get a chance, I'll post another sample with the updated treatment. It won't let me upload a fresh pic. Hmmm. Is OSB the same as rockwool or 703? I don't know the term OSB. EDIT: Should have googled first.....OSB = oriented strand board or Order of St. Benedict. Methinks it is the former. I'd bet a buck that OSB does not have the same low frequency absorbing qualities as rockwool. Maybe I misunderstood, or got too eager and skipped a bunch of important crap...but somewhere on that sight, he was showing something about a double-walled trap with insulation. Now the OSB isn't goingto absorb much, but I'm wondering if it's thin enough that the low waves pass through, and are then broken up/absorbed by the 2" nepoprene...maybe....sorta. Not the same, but kinda close. I don't know enough about this to counsel on the proper way to do this. I have read enough about the subject to know that improper sound treatment/bass trapping can make a room much worse. The biggest mistake being inadequate absorption of low frequencies coupled with killing the high end and liveliness of a room with too much foam. I room needs a healthy mix of absorption and reflective surfaces. How you do that is beyond my knowledge on the subject. Here's an updated file with the new diffuser and improve bass traps. Any better? By the time you tune the room, build new walls, apply treatments, pull out hair... it would be less expensive to buy a $3000 set of V-Drums. I am living proof. I had a full head of hair before I started recording real drums. Sorry, but I'd rather be bald or poor than seen behind a set of electronic drums. Electronic drums, to me anyway...are for singer/songwriters and drumming "enthusiasts". "Real" drummers don't use them...not exclusively. Well, I gave it some thought, and the fridge is gone. It was simple. Cold beer within arms reach.